Well, this could be interesting. 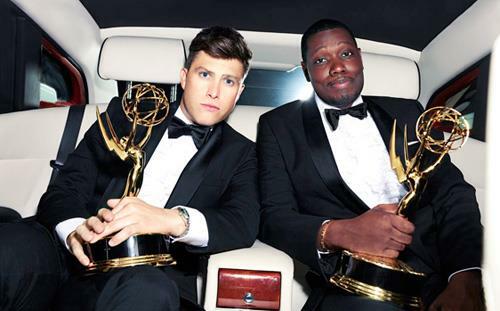 In any normal year, the Emmys would be hosted by one of the late-night talk show hosts from the network showing the telecast. Last year, it was Stephen Colbert (CBS). The year before that, it was Jimmy Kimmel (ABC). These are not normal times, though. It’s NBC’s turn. 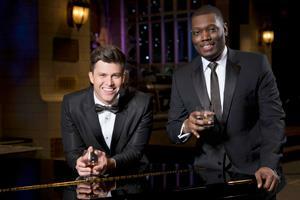 And while it would have been perfectly understandable to hand the reins to The Tonight Show’s Jimmy Fallon or Late Night’s Seth Meyers, viewers tuning into the 70th Primetime Emmy Awards Monday night will instead see Saturday Night Live's “Weekend Update” anchors Colin Jost and Michael Che do the honors. And while it’s true that the host doesn’t do much other than open the three-hour ceremony with a (presumably) topical and (hopefully) funny monologue and then disappear for much of the evening, other than to appear every half-hour or so, to keep things moving along and/or defuse a crisis-in-the-offing, it’s also true that the host sets the tone of the entire evening to come. Michael Che Campbell, a self-made guerrilla comedian — his father, a history buff, named him after Che Guevara — made his bones as a young but relatively obscure observational comedian on Manhattan’s Lower East Side, where he struggled to make a living, despite graduating from the Fame school (Fiorello H. LaGuardia High School of Music & Art and Performing Arts). Che started his firebrand angry-man act in 2009 riffing on race, drugs, and crime as viewed through the eyes of ordinary people — “the human element of situations,” he said in an interview this past summer — but it would take four lean years before Variety named him one of its “10 Comics to Watch.” That was the year SNL creator Lorne Michaels hired him as a guest writer. Che later did a stint as a Daily Show correspondent, where, as a faux-news field reporter, he did live-on-tape bits like the semi-regular, racially tinged “Race/Off: Live from Somewhere,” from cities like Ferguson, Mo. It was Che’s stand-up act, though, rather than his TV gigs that defined him as a comedian with a unique point of view and his own, readily identifiable voice. He was driven to comment on the racial divide and socio-economic inequality. 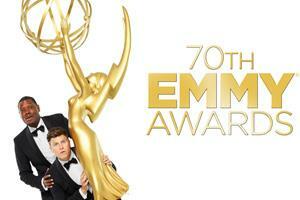 Clearly, anyone looking for a quiet, gentle evening at the Emmys is in for a rude awakening. Meanwhile, Staten Island native and one-time Harvard Lampoon editor Colin Jost, a veteran of SNL’s writing staff since 2005 — almost a full decade before Che signed on — would seem to have little in common with Che except a shared understanding of the absurd and a wry, droll take on events of the day. Che and Jost had an instant rapport from the day they first appeared together on “Weekend Update” — this, around the time long-time SNL watchers were saying the faux-newscast would never be the same again after Tina Fey and Amy Poehler left for greener pastures. It helps, too, that Che and Jost tend to underplay where other comedians tend to overdo it. Che’s stand-up persona leans toward laid-back and languid. He does deadpan with the best of them, and there may well be moments during Monday’s broadcast when deadpan is sorely needed. These are crazy times, after all, even in the era of Crazytown, and emotions are running high. And while it’s true that it’s supposed to be an award show, designed to celebrate the best TV has to offer, it’s also a TV broadcast. And it’s the broadcast where Che and Jost will be expected to carry the evening on their shoulders. They’re certainly entitled to be there: SNL goes into the evening tied with Game of Thrones with a field-leading seven Emmys, and that’s before Che and Jost have cracked a single joke. Che is not intimidated by the possibility that something might happen to cause events to spiral out of control. In his stand-up act, he’s used to adjusting his performance to suit the mood of the room. Jost, for his part, wants to shine a light on the platinum age of television on what is, after all, TV’s biggest night. He told Vanity Fair earlier this month that he doesn’t want the Emmys to be too political in tone — provided, that is, the constant parade of headlines and breaking news doesn’t get in the way. Talking about television, and not Trump, is what makes the Emmys exciting, he said. Jost has not been afraid to ask advice from others who’ve been there before him. No matter what happens at the 70th Primetime Emmy Awards Monday night, one thing is certain: There won’t be a call for any statues.